Definitely one of my favorite stories, Betty! And the illustration is perfect! When I was a child, I imagined that the lights were all fairies in disguise. I love that fantasy. It would’ve been easier if that’s what I had believed, but I was looking for the real live thing: a tiny elf in the branches. A wonderful inspiring adventure. Thank you for taking me along. Wonderful memories, Betty. I was a child during those years, too. And, as a “preacher’s kid” our celebrations were all home made. I always love this story. I can just feel the cozy happiness of that day. 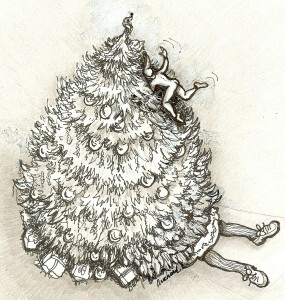 I used to crawl under our tree and look up and picture little elves living amongst the branches. It looked like such a magical world!